When it’s hot out, who wants to turn on the oven and heat up the house? I don’t have air conditioning so I know I sure don’t! But there are lots of alternatives to cooking your meals in the oven. I lived in a ghost town in Nevada for five years. When we moved there, there was a gas (propane) stove and a propane tank that hadn’t been used since who knew when. I refused to have it filled and connected to the stove. So for three years, until we got an electric stove, I got to experiment a lot with many of those alternative methods. Yes, my love of gadgets served me well during this period. When it’s hot, I still rely heavily on my crock pots and microwave. One thing I didn’t have was an outdoor pizza oven. Pizza isn’t something I ever made from scratch but, after making pizza with the Saucy Sisters on our Day of Lavender, I’m planning to change that. I didn’t realize when we were making the pizza that the crust recipe was from Jeff Hertzberg and Zoe Francois’ book, Artisan Pizza and Flatbread in Five Minutes a Day. I told you about this process in my post, Home Baked Bread in 5 Minutes a Day?. You’ll find links to more of their books in that post. I didn’t realize that the crust recipe was from Artisan Pizza and Flatbread in Five Minutes a Day until I saw it in this photo when I was editing. While the pizza making team was hard at work, I went outside to see what Jan was up to. I found her putting wood pellets into her Uuni wood-fired pizza oven! We had no idea we would be baking in an outdoor pizza oven. Wood pellets are inexpensive, convenient and efficient. This oven and the wood pellets make it easy for anyone to have an outdoor wood-fired pizza oven at a fraction of the price of traditional wood fired ovens. Jan already had it set up so I can’t tell you anything about the packaging or putting it together but it looks pretty simple. This model of outdoor pizza oven has a battery operated fan at the back and you can adjust the airflow to control the flame. I don’t think the newer version has that. I forget how many pizzas we made that day – something like 12 or 13. Jan got busy with other things so I got to bake most of them. Such a simple process — just slide them in, wait, slide them out. The only other thing you need to do is add more wood pellets as they burn down. Here’s what our delicious pizzas looked like when they came out of the oven. Our pizzas took a lot longer than 90 seconds but, after watching the video below, I know it was because we never let it get as hot as it was supposed to be. 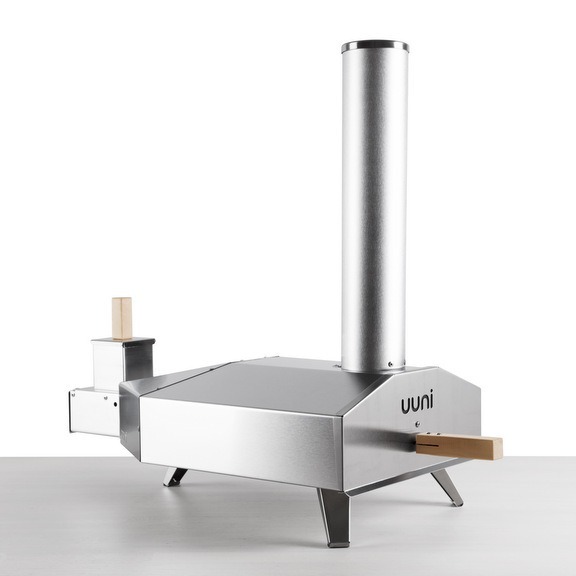 The model of oven that we used has been discontinued but the new and improved Uuni 2S is available from Breadtopia. The new version is stainless steel and has a cordierite baking stone. You can see the improvements in this oven and how beautiful it is in the video below. The oven heats up to 900°F in about 10-15 minutes and will cook a pizza in 90 seconds or less. And it’s not just for pizza! Making pizzas and cooking them in an outdoor pizza oven was so much fun. I can’t wait to get my own pizza oven! What’s your favorite way to cook pizza? Do you have an outdoor pizza oven? Breadtopia, outdoor pizza oven, pizza, pizza oven, Saucy Sisters, Uuni 2s, wood-fired. Bookmark. Oh wow! I’ve shared the video with my husband. He’s wanted an outdoor pizza oven for years! This newer model looks so awesome! The older version was fun but you can tell they made lots of improvements with this new one. Wow, I’ve always wanted an outdoor pizza oven! Just watched the video, so cool, I’m putting this on my list to get for my son for Christmas, thanks so much for sharing!! Would love to know how he likes it if you do get it for him.